Based on the late Navy SEAL Chris Kyle’s autobiography American Sniper, Hollywood legend Clint Eastwood’s latest directing project of the same title features two-time Oscar-nominee Bradley Cooper (American Hustle, Guardians of the Galaxy) in the titular role. Eastwood has an expertise with biographical films after helming: J. Edgar, Letters from Iwo Jima, Flags of Our Fathers, Million Dollar Baby, Invictus, and Changeling. His most recent biopic, however, stands alone as the director’s only one taking place in the 21st century. Per usual, Eastwood gets the best performance possible out of his lead. Cooper becomes Kyle on screen, creating a character that’s real and believable—then leaving the rest up to the filmmaking. Eastwood contains a knack beyond biopics that extends to character-centric movies like Gran Torino or Mystic River. American Sniper ditches a straight-forward plot and instead elects to show a series of vignettes from Kyle’s life that includes phone conversations with his wife, Taya (Sienna Miller- Foxcatcher, A Case of You) that presumably only happened when he was off-base and in the hail of gunfire. The filmmaker selects key moments of Kyle’s celebrated life that culminate in an interesting film, imperative in understanding the war on terror—especially from a soldier’s perspective. That isn’t to say there aren’t subplots that keep the viewer invested, however. The most exciting being the game of cat-and-mouse Kyle plays with an Iraqi sniper that plays out like a modern Enemy at the Gates scenario of sharpshooters from opposing armies hunting each other. 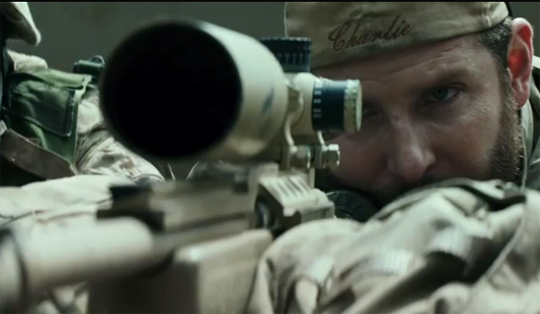 Perhaps the most impressive aspect of American Sniper is Cooper’s honest, uncompromising performance of Kyle. Cooper’s Chris begins the film (after a childhood introduction where his father instructs him not to drop his rifle) as a good old boy on the Texas rodeo circuit. He and his brother, Jeff (Keir O’Donnell- Wedding Crashers, Paul Blart: Mall Cop), work together as professional cowboys. One thing leads to another and Chris winds up enlisting, displaying his abilities as a crack shot, and eventually becoming an American sniper overseas. The character development isn’t without its eye-rolling clichés. In spite of Cooper’s award-worthy performance, Eastwood specifically chooses to show Kyle’s reaction to 9/11 while watching television as if the viewer didn’t already understand how brave and patriotic he already was for enlisting and serving. In the middle of Chris and Taya’s wedding, the festivities are interrupted with news of their overseas deployment. In addition to all of this, action scenes dominate the film, casting a loud, explosive distraction to the growing character study. Perhaps the most creative move in Eastwood’s directing, however, is his technique of playing warzone sound effects over a blank television when Kyle returns home. When the action scenes fade from memory, what remains with the audience will be the decisions Kyle makes looking through his scope with his finger on the trigger. His decisions are never easy, but they always save lives. The film hints at a possible narrow-mindedness toward Iraqis which he described in his autobiography, using the pejorative term “savages.” Eastwood, however, makes the distinction in his newest film between the terrorists and innocent Iraqi nationals. The “savages” are grown adults placing young children into violent, suicidal roles, forcing snipers, like Kyle, to make unbelievable decisions in order to save the lives of his fellow soldiers. Keeping this in mind, Broadway performer Jonathan Groff (“Looking,” “Glee”) cameos as an amputee that Kyle saved during a tour of duty. No matter what the viewer thinks of Kyle, Groff’s character proves that the protagonist is, indeed, a hero because he fights to ensure his comrades’ survival and a chance to return home to their families and friends. In this aspect, Kyle reveals himself to be not unlike Liam Neeson’s Oskar Schindler in Spielberg’s Schindler’s List. He doesn’t regret taking the lives he’s taken, but instead regrets not saving more lives as a sniper. Unfortunately, the rest of the cast aren’t very exciting. The focus is, after all, one person, and a sniper at that, so the ability to create a character outside of Kyle is arduous. Miller’s performance doesn’t extend beyond playing different types. When Taya and Chris first meet, she’s merely playing hard-to-get, and from there on out she’s concerned wife #1—only getting a chance on screen when having a phone conversation intercut with heavy military action. Her scenes distract the action…or does the action distract her scenes? It’s difficult to understand in which situation the audience should be most invested—perhaps that was Kyle’s struggle to reconcile as well? The action has imminent danger, meaning every conversation gets shoved to the backburner because lives depend on Kyle’s attention. In the end, Clint Eastwood’s second film of 2014 (the first being Jersey Boys this summer) was the more successful, but not without its flaws. Bradley Cooper’s memorable performance as an American soldier and hero will surely shine on his acting resume for future roles—he literally chose this role for himself, after all, serving as producer on the film. American Sniper paints a vivid portrait of the lives and decisions made by soldiers overseas when in the heat of combat and how it directly affects the transition returning home. While it isn’t the filmmaker’s most memorable picture, Eastwood’s latest will surely stir up conversation among anybody that catches it in theaters.